Bob doesn't care what Hollywood thinks, a live-action Mario movie could work. If you've ever wondered Bob "MovieBob" Chipman - of Escape to the Movies, The Big Picture, and Game Overthinker fame - thinks about the videogame journalists, or what his perfect game would be, then wonder no longer. Speaking to Examiner.com, he shares some of his thoughts on these topics, and more besides. As someone who critiques both movies and games, it's rather fitting that his dream project would be a fusion of the two. Bob says that he would love to get a shot at making a faithful Super Mario Bros. movie, and prove all the skeptics wrong in the process. Mario did actually make it to the big screen in 1993, but the movie - which deviated quite significantly from the source material - received mixed reviews and was a flop at the box office, and moviemakers haven't touched the franchise since. 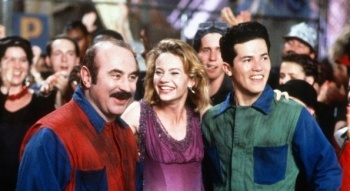 But despite the reluctance of Hollywood, Bob thinks that a Mario movie could work, if done properly. "I'm sick of hearing that series top the list of games that can never be movies," he says. "It's obscene that flash-in-the-pan stuff like Hitman or Uncharted keep getting the movie treatment while the most iconic game characters of all time are denied their shot." Bob's love for the mustachioed plumber runs deep, starting with Super Mario Bros. on the NES and persisting to this very day. He actually credits the game with getting him into games in the first place. "I was over a buddy's house, he'd just gotten an NES, and showed me Super Mario Bros. That was it for me, love at first sight ... I desperately, desperately want to meet Shigeru Miyamoto - the creator of Mario. He's the #1 spot on my 'famous people' list, games or movies, doesn't matter." But as much as he loves Mario, Bob acknowledges that the special place that the character - and others like him - can sometimes muddy the water when it comes to the gaming press talking objectively about them. "Gaming is young. The majority of professional game writers are fans who only just reached pro level, and there's always going to be an element of bias, however minute," he says. "I don't think it's possible to get a 100% unbiased review of, say, a Zelda game because everyone has an opinion of it and for the vast majority it's not just a game but an institution." He also thinks that gamers need to decide exactly how they want videogames to be viewed by the general public, and actually be consistent with it. "You cannot say 'take us seriously as an artistic medium!' when you're railing against Roger Ebert; but then turn around and go 'oh, lighten up, it's just a game!' when people point out that Resident Evil 5 might be a little bit racist." This will change with time, though. Bob points out that Hollywood revolution of the 1970s occurred because a collapse of the old studio system allowed new blood to get into the business. He adds that similar situations in the videogame industry - notably Sega bowing out as a hardware developer and Nintendo needed to recover after the relative failure of the GameCube - has allowed new players, in form of Sony and Microsoft, and new ideas, such as motion controls, into the industry. And if Bob could make his own game? He'd made something that played like a Western game, but with Japanese visuals. "I'd assemble a team where the majority of the programmers and gameplay-designers were from the 'Western School,' but the majority of the art design and story department were from Japan," he says. "My only direct orders would be on the lines of 'dropped health and power-ups instead of regenerating health' and 'if I see an earth tone there'd better be a damn good explanation.'"